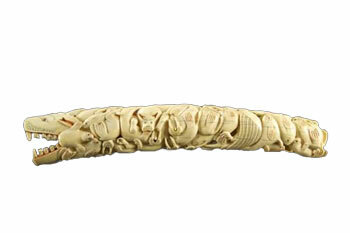 Fire Drill Cord Handles made from walrus teeth, used to rotate the drill stick during friction fire starting. Frank Andrew said that walrus bones, especially walrus jawbones, were stronger and more durable than ivory, which tended to crack. Frank Andew noted: "They engraved carefully, and when the carved area got deep, they would spill water over it. Ivory is easier to work on when it is periodically dipped in water." Ivory is a type of dentin, or calcified connective tissue, that normally includes some water. The water molecules create spaces between the weakly cross-linked protein molecules of the tissue. When the ivory dries out, the spaces where the water was shrink, the protein molecules get closer, and cracks form as the tissue contracts. 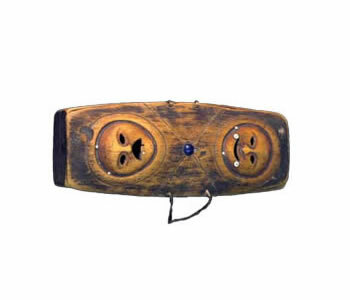 Frank Andrew observed: "They made ivory into belt hooks and bag fasteners, story knives, dolls, earrings, labrets, and other things used for beautification." 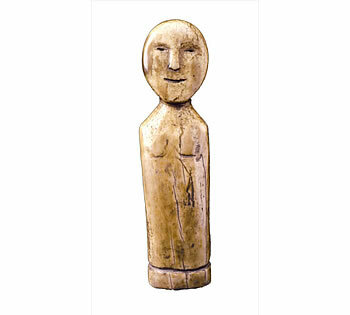 Iinruq/Walrus Ivory Amulet made to both protect and empower the owner. 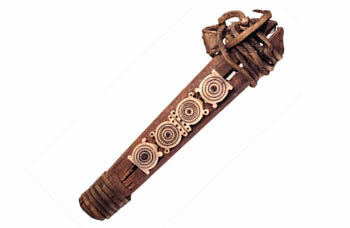 Caribou Tooth Belt with fox teeth and bullet casings dangling from the edge. Theresa Moses recalled how women were careful with their bodies and always used belts to keep their personal debris, like dust, from spreading out to boys and men. Paul John said: "The process of acquiring materials for these belts was not easy. When other people saw women wearing belts like these, they knew that their husbands were excellent hunters." 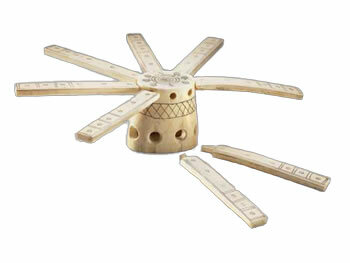 Ivory Device with incised circle designs, said to be for gambling but possibly a calendar with individual arms to be inserted every seventh day in holes carved around the base. 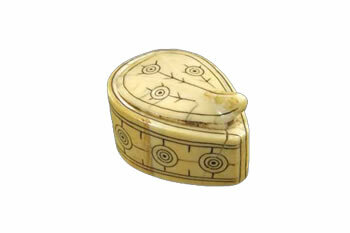 Ivory Tobacco Box from Nelson Island with circle and dot designs, ellanguat, literally "model or pretend universe." 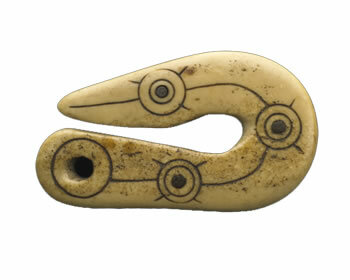 Ivory Box with bird foot design, from Nunivak Island. Ivory Earring Hooks held in a wooden storage device, as the hooks on earring backs easily broke. Wassilie Berlin noted: "Once the earring hook's front and sides were done, it was placed in this vice and decorated. Gosh, people back in those days were so resourceful."